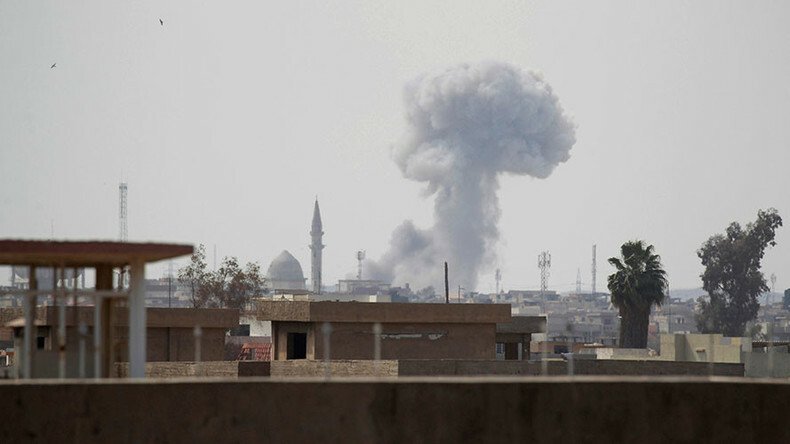 The Pentagon said it will not alter the rules of engagement in the war against Islamic State (IS, former ISIS/ISIL) in Iraq as the US-led coalition faces allegations of killing dozens of civilians in one of their airstrikes on Mosul. US forces are not planning to change the way they conduct airstrikes despite the battle for Mosul entering more densely populated areas in the Western part of the city, the spokesman of the US Central Command, Colonel John Thomas, told reporters. “General Votel is not looking into changing the way we operate other than to say our processes are good and we want to make sure we live by those processes,” Thomas said, referring to the General Joseph Votel who heads US Central Command, as cited by Reuters. The statement comes as the US-led coalition faces allegations that one of their airstrikes on March 17 killed dozens of civilians. If confirmed, this would be one of the deadliest single incidents involving civilian casualties in a recent conflict in which the US military was actively involved. The alleged airstrike hit western Mosul’s al-Jadida neighborhood destroying a residential building and burying dozens of people under the rubble. 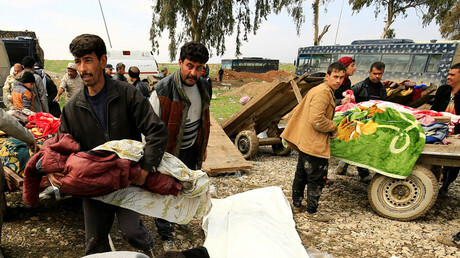 The Iraqi military said in a statement that 61 bodies were subsequently pulled out from the ruins, while a municipal official said that the death toll of the attack reached 240. According to Reuters, the rescue teams are still working at the site. Information about the incident emerged days after it happened. On Friday, March 24, a video appeared showing the aftermath of the attack. Only after that did the US-led coalition and the Iraqi military finally issue official statements commenting on the tragedy. The Combined Joint Task Force — Operation Inherent Resolve (CJTF–OIR) admitted that the US-led coalition did carry out an airstrike targeting the area around the time when the incident happened — but said it was conducted at the request of the Iraqi forces and stressed that it is still unclear if it has anything to do with the mentioned civilian casualties. In the meantime, the Iraqi War Media Cell issued its own statement concerning the incident, in which it said the building was likely blown up by Islamic State terrorists’ booby trap and had not been targeted by a coalition airstrike. “A team of military experts was formed from field commanders to inspect the house [mentioned in the media reports]. The house was completely destroyed … and all its walls were booby-trapped and there is no hole or indication that it was subjected to an air strike,” the statement says, adding at the same time that remains of a large car bomb and a detonator, which could have potentially triggered the explosion, were found near the house. The Iraqi forces’ statement about the rubble of a completely destroyed building bearing no signs of an airstrike is somewhat contradictory in itself, Charles Shoebridge, a former security analyst and counter-terrorism expert with the British Army and the Metropolitan Police told RT. “The Iraqi security forces say that there were booby traps there, they say there was no evidence in terms of holes… in the roof of the building, where an air bomb projectile could have landed. But that seems to be contradicted or at least an element of inconsistency introduced, when they say that the building was totally destroyed, which begs the question – what kind of evidence they were hoping to find?” Shoebridge said. These statements also contradict the accounts by witnesses and first responders working at the scene who said it was an airstrike that destroyed the building. “The international coalition air forces dropped bombs on this house, and everyone who was inside died. Children, women, men, the elderly,” a Kurdish journalist from the Rudaw news agency, Hevidar Ahmed, told RT on Friday. “We felt the earth shaking as if it was an earthquake. It was an air strike that targeted my street. Dust, shattered glass and powder were the only things my wife, myself and three kids were feeling,” a Jadida resident, Abu Ayman, told Reuters on Saturday. In the meantime, an RT crew on the ground has learned that Iraqi forces are barring journalists from visiting certain areas of Mosul, which have been severely bombed to avoid the negative coverage of their actions in the media. “Going to the more destroyed neighborhoods is all but forbidden. On one occasion, when [we] were filming a destroyed building, an Iraqi officer walked up to us and said that we cannot do that. On another occasion, they gathered all the journalists together and told us bluntly that negative coverage of the operation would see us kicked out,” RT’s Murad Gazdiev, who is reporting from Mosul, said. In the meantime, Mosul residents have been telling the RT crew that the devastating — and often indiscriminate — airstrikes are becoming a grim reality of life in the city. One Mosul resident said the bombings “have destroyed everything, they were non-stop.” The actions of the Iraqi forces and the US-led coalition have already raised questions among some of Iraq’s Sunni lawmakers. Some 400,000 civilians are still trapped in the Old City part of Mosul held by IS militants, facing food and electricity shortages, a representative of the UN High Commissioner for Refugees (UNHCR) in Iraq earlier told Reuters, adding that between 8,000 and 12,000 people are fleeing the city daily. 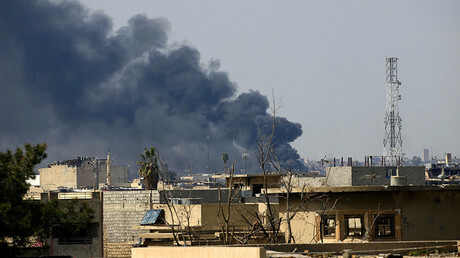 The US insists that no more than 200 civilians were killed in coalition airstrikes in Mosul, but the UK-based monitoring group, Airwars, says the number may be more than ten times higher.